Your garage is one of the most vulnerable parts of the home, because it’s often overlooked when trying to beef up security. Whether you use your garage as a workshop, a storage area, or simply to park your car, there are some inexpensive – or even completely free – ways to make it safer and more secure. 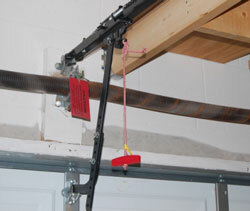 Automatic garage door openers are required by law to have an emergency release, typically a pull rope with a red handle for easy recognition. Most homeowners don’t realize that it’s fairly easy to unlock the emergency release from the outside using only a coat hanger. Unless you have small children or another reason to leave this device accessible, securing it with a zip tie or other restrictive method will increase the garage security. Remember that the emergency release is there for a reason, however, and always have a plan for how to put it into use quickly if the situation demands it. Garage doors with remotes controls are particularly vulnerable, because many people tend to leave their remote in the car. Most remotes are now available in small sizes or even as key fobs that can be attached to your key ring to make it easy to carry with you. But even if you don’t have a smaller remote, you should still keep the remote in your possession throughout the day rather than tempting questionable people by leaving it in easy access while you are away from the vehicle. Keep in mind that if your vehicle ever gets stolen with a garage door opener remote inside, the thief could easily find your home address from documents (insurance card or registration) inside your glove box or from the “home” location on your GPS. 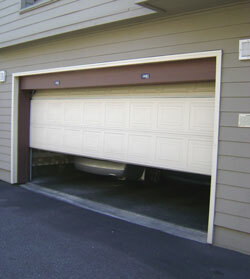 The San Jose Police Department provides useful information for securing your garage, including the advice to make sure all “people” doors are properly locked. Don’t depend on standard door locks to protect your belongings, but install double-keyed deadbolt locks that can only be opened by someone with a key to the door. Similarly, don’t leave a “spare” key in a place that is obvious or easy to access. If you must leave a key for someone to use, store it in a place that is not immediately adjacent to the door. Door jambs and welcome mats are never a good place to leave a key, but storing it under a seemingly random stone several yards away is slightly safer. If you value the things you have in your garage, you should never leave it open (or partially open) when you’re not there. This includes taking a break inside the home as well as making a quick run to the corner store. It only takes a moment for someone to find your tool cabinet, take what they want, and disappear. So keep things safe by keeping the doors closed when you are not physically there to watch things. Accidentally leaving your garage door open through the night is something that happens more often than you’d think. Before heading to your bedroom at night, make it a habit to check that your garage door is closed and any other outside doors are locked. Criminals can scope out your garage easily if there are windows in the door or walls. 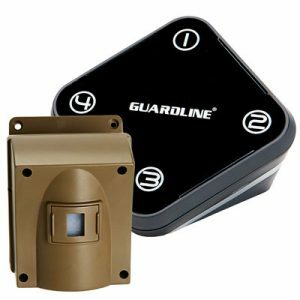 This allows them to easily identify valuable possessions or easy access points to the home itself. To eliminate the threat posed by windows, consider applying one-way film over them, or even covering them completely. Removing the temptation will not eliminate all of the danger of illegal entry, but it will make the garage a less appealing target. A home security system will reduce the cost of home insurance by a significant amount, but many homeowners omit the garage when installing them. Motion detectors, video doorbells (like Ring), security cameras, and automatic lights are all great tools for frightening a potential interloper away or recording their actions. A simple alarm will do in a pinch, creating enough noise to attract the notice of neighbors so that a criminal will not have a chance to do any harm before they are challenged. It’s recommended that those who live in a rural area or have a long driveway install a good driveway alarm on their property. When someone enters on your property, a wireless signal is sent to an indoor receiver that immediately notifies you of their presence. It’s great for peace of mind as well as giving you a head’s up when an expected (or unexpected) visitor arrives. It is always a good idea to be on friendly terms with your immediate neighbors. This allows you to keep an eye on each other’s property, and they can pick up your papers or mail when you are away. Making it appear that your home is occupied is often the best security you can get, and your neighbors are one of the best ways to pull off that illusion. If you notice it’s late at night and a neighbor’s garage door is open, be a good neighbor and make sure they simply didn’t forget to close it for the night.